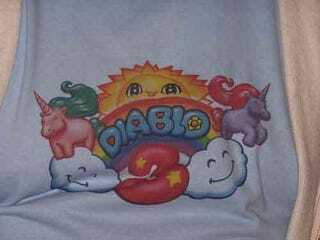 Where Are The Official Diablo III Rainbow Unicorn Shirts? During last year's BlizzCon, Jay Wilson was sporting the most glorious Diablo III t-shirt ever created, hinting that strong demand could lead to a public release. What happened? It's nearly a year later, and Diablo III game director Jay Wilson is now sporting a rather fetching bit of beardage, but the legendary shirt is nowhere to be seen. The outpouring of demand was readily evident, and third-party companies have made a tidy sum producing knock-offs of the design. Where's the real deal? BlizzCon: Where Are Diablo III&apos;s Runes? "The shirt wasn't produced through normal Blizzard channels," Jay explains. "It was something the team had made on their own." Therefore the shirts never underwent any sort of official approvals process, which explains why Blizzard didn't immediately put them up for sale. There's still hope though. "It's our intent eventually to make them. Whether we make them for public consumption I'm not sure - I don't see why not. I've got other fish to fry." I think we can all agree that working on getting the game finished is slightly more important than releasing a silly t-shirt. Slightly. As for third-party bootlegs, Blizzard is aware, and will frown in a legal fashion at any company that seeks to make their own unauthorized versions.